I am a member of the National Federation of Plus Areas, formerly known as the National Federation of 18 Plus Groups. I joined Huddersfield 18 Plus Group in 1977 when I was 19. In 1991 I transferred to Bradford 18 Plus Group, now Bradford Plus Group, and the following year I moved to Horsforth 18 Plus, now Leeds Plus Group. In 1997 I renewed my membership with the new Huddersfield 18 Plus Group and now I have retturned to Leeds Plus Group. I have also been associated with the "Dossers" in previous years. Click here if you wish to make an enquiry about Plus. The new Huddersfield 18 Plus Group was launched in April 1997. meetings took place every Thursday at the Old Court Brewhouse, Queen Street, Huddersfield, (meetings later changed to Monday evenings), the launch night was a Juggling Workshop, and display, and the second meeting featured a mock trial. The Launch Night, and Juggling Workshop on Thursday April 3rd 1997 started at 8:00 p.m.and was organised by prospective new members Stacey Murphy, and Matthew Schofield. Expert juggling tuition was provided by members of the Huddersfield University Juggling Club, the evening was rounded off with a spectacular display of Fire juggling. Members from Bradford, Leeds, and Rothwell Groups supported the event, a display on past and future events for the benefit of Prospective new members who attended the Launce was set up. The following Thursday, April 10th 1997, was the Group's second meeting. and as the Old Court Brewhouse function room is a former Court 18 Plus itself was put on Trial. Presiding over the Trial, as Judge was Councillor Howard Middleton from Bradford, Howard is a former member of the Sheffield, and Bradford Groups, and an 18 Plus Yorkshire Area Honourary Life member. The Jury was made up of Huddersfield 18 Plus Group's prospective new members, and visiting members from other Groups. The charge was that 18 Plus was not active, and the prosecution was conducted by 18 Plus Yorkshire Area Publicity & Development Officer, Mr John A Smith, assisted by former Wharfedale 18 Plus memberr, then a Worcester 18 Plus Group member, Mr Philip Bettis. Hull 18 Plus Group member, and 18 Plus Yorkshire Area Vice-Chairman Mr Paul Williams was Councel for the defense, he was assisted by former 18 Plus Yorkshire Area Chair, and Bradford 18 Plus Group Activities Officer, Miss Catherine Overend. Members from Bradford, Doncaster, Leeds, Rothwell, and Worcester 18 Plus Groups attended the event along with 18 Plus Yorkshire Area Chair, Wendy Turner, and National Publicity Officer, Judy Horsburgh. Witnesses were called from among these members. The prosecution called witnesses who had attended various Yorkshire Area, and National 18 Plus events recently, including, in the Yorkshire Area - the Haloween Disco, the Pyjama Party Disco, and the National 10 Pin Bowling Competition & Christmas Party Disco, and Nationally - the National 18 Plus Easter Holiday at Camber Sands in Kent. No Huddersfield 18 Plus Group members had attended these events as they had taken place before the Huddersfield 18 Plus Group had opened. The Defense called witnesses who had attended the Group's first two meetings, and witnesses who had helped put together the first Programme of events for the new Huddersfield 18 Plus Group. The Jury returned a guilty verdict, and the Judge passed a suspended sentance as there is evidence that the new Huddersfield 18 Plus Group will be active in the coming months. It is quite clear that 18 Plus is an active organisation nationally, in the Yorkshire Area, and now in Huddersfield. As you will have read above, on Thursday April 10th Huddersfield 18 Plus put "18 Plus on trial", the charge being that 18 Plus is not an active organisation. Prosecuting was John A Smith, (Huddersfield 18 Plus) assisted by Phil Bettis (Worcester 18 Plus), and the defence was conducted by Paul Williams (Hull 18 Plus), and Cath Overend (Bradford 18 Plus). A Jury was selected from those present, and as you know 18 Plus was found guilty! An appeal was granted, and National Publicity Officer Judy Horsburgh conducted the defense at the re-trial. Please note, this was a fun event, and not to be taken too seriously. In the past I have been associated with the 18 Plus "Dossers". Click on the Link to read some stories and annecdotes. The "Dossers" premier event has been the WASH weekend. At the moment I am Northern Area Publicity/Development Officer and National Chairman. In 1996 I was War of the Roses 1996 Chairman, this was the event that got me interested in 18 Plus Committee work again. I was next co-opted on to the Yorkshire Area Committee in late 1996 as Publicity & Development Officer. 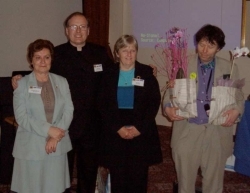 As Yorkshire Area 18 Plus Publicity and Development Officer I have been responsible for co-ordinating the 1997 Yorkshire Area Publicity Campaign, which included the 1997 Charity Challenge. I was also responsible for the first part of the 1998 Recruitment Campaign, which included the Y.T.V. Community Service Announcement. Here I am "in the spotlight" in an article in the Yorkshire Area 18 Plus newsletter Alyve. In 1997 I also became Development Chairman for the new Huddersfiel 18 Plus Group. In early 1998 I was co-opted as War of the Roses 1998 Chairman. I was also one of the War of the Roses 1999. Co-ordinators and War of the Roses 2000 and War of the Roses 2005 organiser. From 1998 to 2001 I was National Development Officer. In 2002 I became Chairman of the Leeds 18 Plus Group. I was also a Northern Area General Committee member. In November 2003 following the resignayion of Mark Randall I became Northern Area Chairman which led to my election as Deputy National Chairman and thus Acting National Chairman in July 2005 and National Chairman in January 2006 and April 2006. There were so many people to thank, I hope we included everyone, if not, then heres a special thank you for those we missed. At the June National meeting we appointed Kirsty van Lieshout as Publicity Officer, she has big plans to publicize Plus which I hope everyone will get involved with. We also re-appointed Dave Filer as National Activities Officer, I know this isnt a Constitutional post, nevertheless the NEC felt the need for the post to co-ordinate activities and help with procedures for organising events for Plus nationally. Sadly no Training Officer was appointed, nor Internet Coordinator, though Mark Hewson stood in at the meeting. Between now and the end of the year there are many exciting events planned, especially those for members nationally; theres the Kings Lynn Group Summer Do which includes the National Rounders competition, the Milton Keynes MAD weekend which includes the National Karting organised by Soton Friends (Plus) Group, Northern Areas NEAT weekend in Sheffield which includes a new National Pool tournament and of course WASH in November. At the June NEC meeting a small group led by National Publicity Officer, Kirsty van Lieshout was set up to create a new image for Plus, including a new logo, the groups ideas will be presented to the July NEC meeting and launched nationally in September. Many opportunities for publicity are presented by the changes to Plus! The first week in October is National New Members Week, lets start planning and publicizing for it now, there are plenty of great events at Group, Area and National scales to promote to prospective new members and then by October lets sign up as many new members for WASH as possible and surpass the WASH 300 target. I was a bit surprised when Ian asked me to write a piece for the Chairmans bit in Plus News! As Im also Northern Area Chairman I must mention the Bradford Bargain Break, thanks to everyone who attended and made it such an enjoyable event, Id also like to thank Janet Rintoul who was the chief organiser and motivating force behind the event  well done. Well done also to Richard Morton, this years winner of the National Go-Karting competition which was held on the Saturday. We are investigating the possibility of running the event again in 2006. The latest NEC meeting was held in early October, this was the second that I chaired; I may be starting to get the hang of it now. Sandra Brogan said I was masterful, just dont mention the apple pie! The NEC and others are working hard to put the Area Lead Option for the restructure into practice. Read more about this further on and in the Gazette. While writing this article the thought struck me that in a way 18 Plus will be a new organisation next year, so why not have a recruitment drive to Publicise the new 18 Plus? All the Groups, Areas and National should be involved. Its all very well having a new structure to make 18 Plus well organised at the administrative level, but if 18 Plus isnt recruiting new members then were going nowhere. This would be a good topic for Onelist; lets talk about recruitment ideas, but more importantly, lets put the ideas into action as well! I was recently asked where Id like to see 18 Plus this time next year  settling in to the new structure, members getting involved in their Area Conferences to make decisions to ensure the continuation of 18 Plus into the future, new 18 Plus and Quest Groups being opened and all existing Groups recruiting new members. The more you put into 18 Plus, the more you get out of 18 Plus! or click on this link to send E-Mail to me now.